It was snowing on Saturday February 1st as we left our house for O'Hare International Airport with crossed fingers, toes, and any other part of our body that could be crossed. The snow had begun late the previous evening and had been pretty steady. Checking our flight status, it still said we were scheduled for an ontime departure. As you can see from the image above, we did get out of town and to Miami where we spent the night before our cruise. This is something we recommend to our clients - leave a day early to allow for the unexpected (like the 6 - 9 inches of forecast snow in our case). We've been cruising for over 30 years and have been to many exotic destinations. 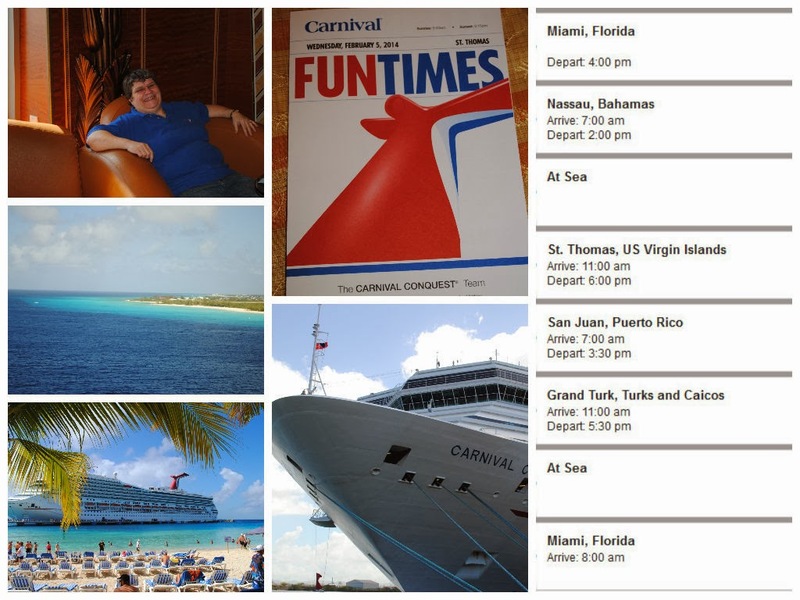 These ports were on our recent repeat list with the exception of Grand Turk. We'd even been on Carnival Conquest previously as well, but we wanted to experience the Fun Ship 2.0 upgrades and quite frankly escape from our winter weather while having some new stories to share with our readers. Bookmark this post to follow the entire story from start to finish. This will be our anchor posting with a dynamic index to articles, images, and other resources. We loved this cruise, so that should give you an idea of what will follow in the next posts.